. Published on December 17, 2014 . 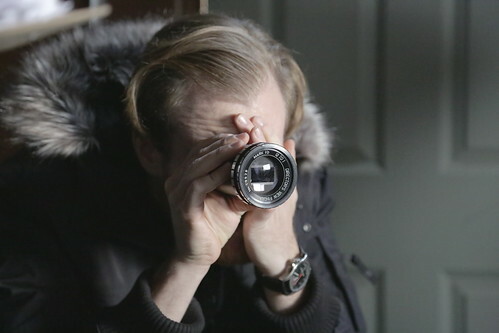 Director of Photography, Ian McAvoy, takes a moment to visualize for the film, At Papa’s. This semester, I embarked on a huge journey. Little did I know that the journey would be the most important semester of my graduate studies and within my education as a whole. The journey, which is far from over, was to figure out story. Not only what kind of stories I would like to tell while at Columbia but moving forward as well. It involved figuring out where my stories come from, where others’ stories come from, and how we make decisions in order to share those stories. I started the semester back in September with a clear plan of how I wanted things to go. I was going to blow it out of the water with my classes; I was going to have the most organized and well-prepared thesis film; I was going to shoot that film and have one of the best products I’ve ever created in my hands; I was going to do it all with confidence and vigor. But things did not go according to plan. I’m not sure that they ever do. At one point in the beginning of the term, my advisors told me that they thought I was compromising on my story. Or in other words, that I had a lot more to say that was not on the page or that was not being addressed by my writer. They told me this a couple times and I chose to fight the notion. I was convinced that you win some and you lose some and that this is what collaboration is. Looking back, I was wrong. I was compromising. I was trying to be a good collaborator but I wasn’t fighting for the best story. Why wasn’t I fighting for the best story? I knew that certain elements and pieces of the story felt off. I look back and I see that I was doubting myself and my own abilities with what stories I can tell and have to tell. I let other people take the reins because I thought they might know better and I wanted to trust them. My story then changed because I was not trusting myself. Actors Lia Sullivan and David Kravitz in a blocking rehearsal. The best part of this is that everything crumbled. It was though the film Gods and the people around me were all slapping me in the face as if to say—“try that again.” With two weeks out from production, I took a risk and I made a new story, a story that was mine, with two writers that helped me put it in a script that I was really happy with. Story Lesson One: Do not compromise story. Trust your gut to tell the story that you want to tell and tell it the way it should be told. At this point, with a lot of crap hitting the fan, a person can get a little hard on themselves for not making better choices from the beginning. It’s tough though. Thesis holds a lot of weight in the MFA program and you have a lot of eyes on you. The pressure can get to some. It got to me. But then I took a step back and I looked at my classmates. I was and am not the only one struggling with these things and soon I realized that that’s why we are here—to learn about ourselves and to be better filmmakers because of it. Key team members wait around the monitor before going for a take. I’ll be helping with one of my classmate’s thesis in January. She’s had a great story from the beginning but just this past week, it was realized that there was a contradiction in how the story was being told. We have a little less than a month before we go into production and now in this situation, we are also talking about some significant changes in the script. On one hand, I want to wipe my brow and say that I’m glad I’m not the only one. On the other hand, I am intrigued and impressed by how deep the understanding of this story drives. How cool is it that hours can be spent in discussion over the story and now we have every opportunity to tell it right and to do it justice. The film is going to be profound and beautiful and it’s all because we do not just stop, wipe our hands, and say “the script is done.” We appropriately have the ability to stop at any moment and verify if what we are doing is right for the story. Story Lesson Two: The story is a living and breathing thing. “Locking down the script” is a somewhat silly notion. Check yourself at every turn. Ask yourself if what you’re working on currently is appropriate for the story and don’t be afraid to change something that needs to be changed. There are other lessons that I’m sure I am well on my way to learning. I look back at this semester and I feel exhaustion, stress, maybe a little regret. But I also feel proud and I get really excited about what is to come. Beyond these wonderful resources, the biggest thing I recommend is to start getting out there and telling your stories. The best lessons come from doing. Our slate on one of the last days of principal photography.